The novel is a literary genre whose history is 1000 years old; and this history is not without its controversy. Lady Murasaki, a well placed court figure in a Japanese emperor's retinue, is said to have written the first 'novel'. The Tale of Genji, is a long narrative with some development of character, plot, and place. Whether this story is the first novel or not is in dispute. Cervantes' classic, Don Quixote, a work from the 16th century is another early example of the form. The novel is just one of several forms that literature might take: poetry, drama, short prose, and non-fiction are other common genres. In the Greek classic tradition there were but two types: tragedy and comedy. Our penchant for division is inexorable. These days we further split the categories into subcategories and, no doubt, there are categories of the subcategories. Splitting hairs seems to be what our feeble intellects prefer. While this discrimination can be useful in understanding the nature of the beast we are dealing with, such labeling can also be detrimental when it comes to a clear view of the work. Clarity is often obscured by sentiment. Meet an old man with a young wife and what do you have? Cradle-robber. Gold digger. Richard Avedon. © The Richard Avedon Foundation. His prose smacked more of drama than not. Reading Beckett's 'novels' with this in mind produces a different outcome. Are they then anti-novels? Literature noir? Prose-drama? None of the above? Ultimately, these are just more labels. The key point here is this: Avoid conceptions, labeling, discrimination. Yes, you must stop on the red and go on the green. 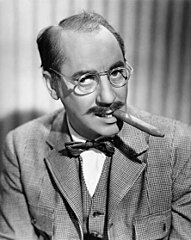 But ... And whether the discussion is about Samuel Beckett or The Muppets, best to remember that inevitably an object labeled 'cigar' is always just an object labeled 'cigar.' Anything else is just smoke and mirrors. 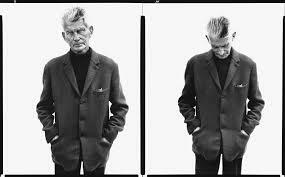 2 Samuel Beckett, as related by James Knowlson in his biography. I had never looked at the concept of the novel in this way. Actually, one of the things I enjoy about the novel is the sheer variety and creative freedom. What is the author trying to say? How are they trying to say it? There is endless variety and an open mind is definitely required. I tend to employ a novel as a form of escapism, but will often divert to challenge myself.